Aisle Safety Signs: Strong but FLEXIBLE. Our Aisle signs flex unlike dangerous metal aisle signs. © 2017, SafetyBanners.Org. All Rights reserved. Patent Applied For. Patent Applied For. 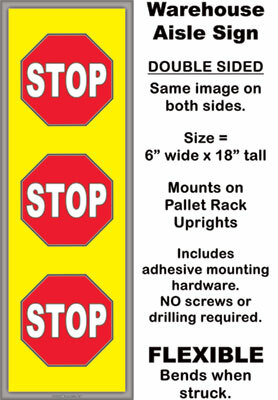 CLICK HERE for all our forklift aisle safety signs. NOTE: Custom forklift aisle sign design is available. Call Cyndi at 901-759-0932, or email her using the "email us" button above. When you expect the best, we deliver.